If you’re like most people, at some point today you probably sat down to a table that presented you with a fork, a knife and a spoon. It’s likely that you did not find this arrangement perplexing or confusing. You knew to grab the spoon when you had a bowl of soup in front of you, to grab a knife when you had a steak in front of you and so on. The utensils were complementary, each performing a different function that made them well suited for certain tasks, and less suited to others. An exploration of two common use cases reveals that the best approach might be for users to have an array of complementary tools—a full set of utensils, if you will—at their disposal, rather than just one. Let’s take a closer look. Scan data, such as the data set represented here, frequently needs to be combined with BREP geometry. 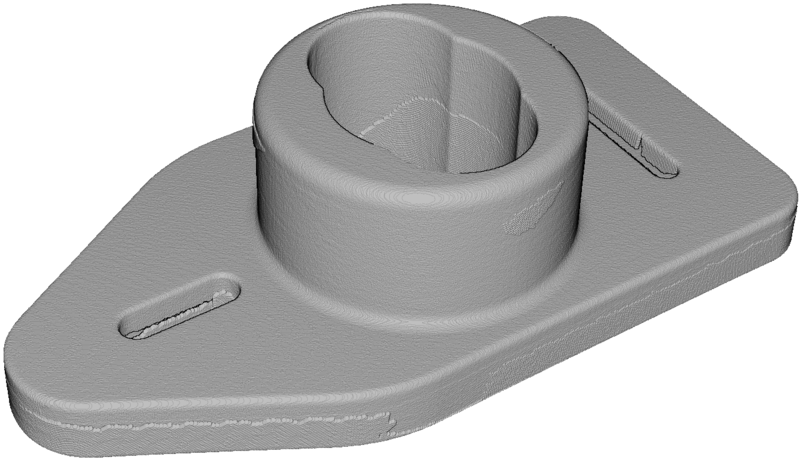 While one software tool can enable this modeling with two types of data, another tool is likely to be best for preparing the model for 3D printing. For 20 years, boundary representation (BREP) has been the dominant way to define models in the manufacturing world—but other types of 3D representation, such as faceted data, are growing in popularity. Much of this growth is driven by an increase in scan data across multiple markets. Laser scanners are becoming increasing affordable and ubiquitous, capturing scores of information at both a micro and macro level. Meanwhile, in the medical field, biological information is gathered via CT scans, rasterized versions of X-rays and other techniques to create various forms of prosthetics, implants and other devices. Once all this scan data has been sanitized and turned into triangles, people need a way to bring it together with their BREP geometry and be able to work on it in a single session. Doing this requires a unification of the two datatypes in one environment, something that a tool like Siemens Parasolid provides with the addition of its new set of Convergent Modeling tools. This convergent modeling environment opens up all kinds of possibilities for working with faceted geometry. Suddenly, you have the ability to perform serious modeling operations on your facet data—everything from Boolean operations, to cuts, sweeps, and blends. Better yet, the models can maintain the topology of BREP geometry when it is brought into the faceted world. For advanced shape authoring and editing, Parasolid is an appropriate modelling toolkit. Additive manufacturing has surged in popularity in recent years, making 3D printers an increasingly common output for models. Unfortunately, 3D printing is still a notoriously finicky process: Every file must be completely print ready or the results can be disastrous. Let’s turn to the medical field for an example. Having a watertight STL file to print is a necessity for producing a dental implant. If the model of the implant has even a tiny hole in it, the printed result will be hollow rather than solid. If this hollow implant is subjected to even a small amount of pressure, it will shatter—which, of course, is not the desired result for something being implanted in someone’s mouth. Preparing data for 3D printing isn’t just a matter of looking for holes—there’s all manner of other adjustments that need to be made to ensure a truly watertight file. Sometimes your triangles are intersecting one another, which is not printable, so you need to remove those self-intersections. Other times, you have more than two triangles sharing an edge; that’s called a non-manifold triangle, and those need to be removed as well. On it goes with various other nips, tucks and rearrangements. This is where a tool whose focus is mesh healing and preparation for 3D printing comes in handy. MachineWorks Polygonica provides an example. You can quickly and easily flip triangles in the right direction and remove self-intersecting and non-manifold triangles. You can also prepare files for 3D printing through numerous other tools: simplify mesh to reduce the triangle count by orders of magnitude; merge, offset and hollow meshes; and create a set of parallel 2D slices for output to a 3D printer. It doesn’t do modeling with BREP data, and it’s not as full featured as Parasolid, but if you need to quickly work with triangles to prepare them for 3D printers, Polygonica is a good tool for the job. As the use cases above illustrate, it’s not a case of one geometry toolkit versus the other. Both toolkits profiled are good for their given use cases—complementary even. This represents the best way to approach geometry toolkits: seeing them as different tools that together can provide a full spectrum of functionality. There’s no need to take an “either/or” approach when “both/and” is a viable option.